Oil Spill Near Santa Barbara Fouls California Coastline : The Two-Way A pipeline rupture spilled some 105,000 gallons of crude. Some beaches were evacuated, and it's unclear if they will reopen in time for Memorial Day. 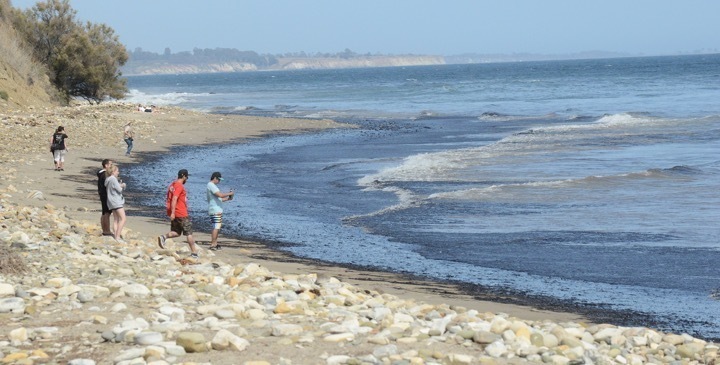 In this photo provided by the Santa Barbara County Fire Department, people walk on a beach with an oil slick from a broken pipeline off the central California coast near Santa Barbara on Tuesday. A nine-mile slick of spilled crude has fouled parts of the California coastline near Santa Barbara, officials say. Mark Crossland, a captain with the California Department of Fish and Wildlife, said some wildlife will likely be affected because of the spill. "Federal, state and local authorities arrived at the scene to investigate the cause of the leak and coordinate cleanup efforts, said Alexia Retallack, spokeswoman for the California Office of Spill Prevention and Response. Gov. Jerry Brown was briefed on the incident and is 'monitoring the situation with great concern,' said spokesman Evan Westrup." NBC News reports that Refugio State Beach was evacuated and authorities issued warnings for another beach. "Officials could not say whether the beaches would be open in time for the holiday weekend," NBC reports. "Campers were forced out of a nearby state park." USA Today reports that Plains All American Pipeline, which owns the ruptured pipeline, said it regretted the incident and that it was "making every effort to limit its environmental impact." "The scenic stretch of coastline about 20 miles northwest of the pricey real estate of Santa Barbara is dotted with state-run beaches that are popular with campers, and the spill comes just a few days before the Memorial Day holiday weekend and subsequent summer camping season begin. "The stretch of coastline is also home to many oil rigs and drilling operations, and small amounts of tar and seepage show up on beaches, but in much smaller amounts. "The Coast Guard, county emergency officials and state parks officials had begun cleaning up the spill." The Santa Barbara County Office of Emergency Management said it could three days to clean up the spill.